I’ve tried up to Barret so far and they work. Please note that the words are case sensitive so any capitals need to be input as seen. For example, Agrias’ 2 passwords are Holy Knight and Holy knight. (I’ve confirmed it myself that both passwords work as intended.) Of course, following the punctuation and spacing exactly is important too! Shameless plug: I’ve got a ton of photos I took of Curtain Call and I’ll probably be taking a ton more soon. 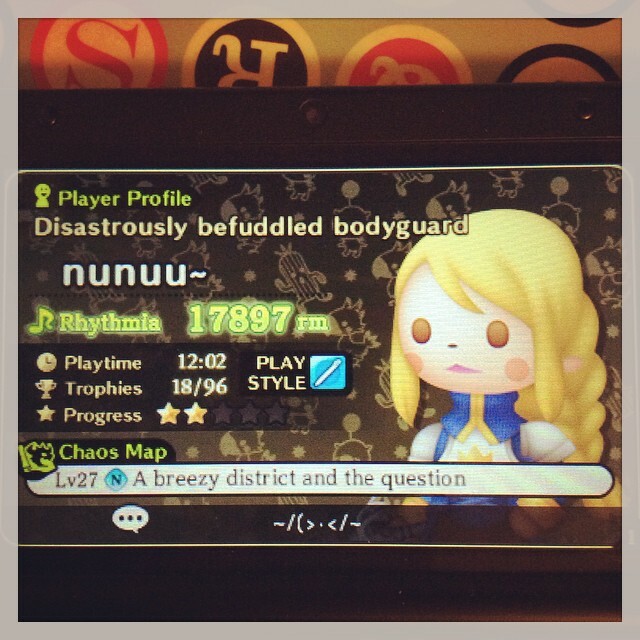 XD You can see them at http://websta.me/n/koukoupuffs There are some non-Theatrhythm images in between though. Note: I’ve made a correction with #101. The FAQ listed it only as Kefka but it’s actually Kefka Palazzo. 027 Laguna My manly charm I’m the prez! 040 Vaan Two a’s please How old are you again? 041 Ashe Crowned at nineteen Balthier! 079 Captain Do not approach Rebels!? 086 Cagnazzo King faker Who is Kainazzo? 087 Barbariccia Flowing locks Valvalis? Valvalicia? 088 Rubicante Flash a little leg Rubicant? Close enough. 096 Exdeath Loves nothingness That’s a tree!? 100 Deathgaze Random Encounter Cough up that Bahamut! 101 Kefka Palazzo Mad clown Uwee-hee-hee! 110 Pupu An alien More please! 115 Black Waltz 3 Kwahahahaha! You…you scum! 117 Trance Kuja Flare Star Who’s the fairest? 127 Mandragoras High sodium Cover your ears! 135 Bahamut Sin Another blow to Midgar Where’re my wings? 139 Atlas Just plain huge Where’s the off switch!? 144 Sand Worm Swallowed! Worm or caterpillar? 146 Magic Pot Inside’s a secret Gimme an Elixir! 148 Tonberry Creeping closer Watch the knife! 150 Cactaur Can’t hit me Stop dodging! 156 King Bomb Ugly mug Ka-BOOOOOOM! 157 Malboro Halitosis Got Remedies? 159 Flan Flanitor? Where’s my spoon?